Paul Pogba is back... in a big way. The Manchester United midfielder made his long-awaited comeback on Saturday afternoon after being sidelined for two months with a hamstring injury. 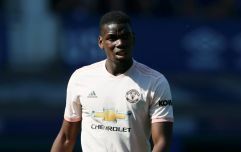 Pogba scored one and set up another in United's 4-1 victory over Newcastle at Old Trafford and the openness with which the Red Devils attacked proved just how much the Frenchman was missed by the side in his absence. After tapping home a clever header from Marcus Rashford shortly after half-time, Pogba celebrated by crossing his wrists as he ran to the touchline, a gesture which piqued the curiosity of many supporters. The 24-year-old picked up the man of the match award on his return to Premier League action and, after the game, he explained the meaning of his celebration. "While very happy to be back, my prayers go to those suffering slavery in Libya," Pogba wrote on Instagram. "May Allah be by your side and may this cruelty come to an end!" Saturday also saw the return of Zlatan Ibrahimovic, last season's top scorer for the Red Devils, and it would seem like Jose Mourinho's side are well-positioned as we approach the midway point of the season. "Of course, we won we got the three points that’s the most important thing," Pogba told BT Sport after the game. Zlatan came back, I came back and Marcos came back, we are happy. "It hurts a lot because you want to help the team and you can’t because you have to do your recovery. “I see the same team. I feel the same atmosphere with the team. The season is very young it’s not about now it’s about the end of the season so the criticism we just forget about it."